Copenhagenize.com - Bicycle Urbanism by Design: Crazy New-Fangled Idea! Cycling in Parks! Crazy New-Fangled Idea! Cycling in Parks! 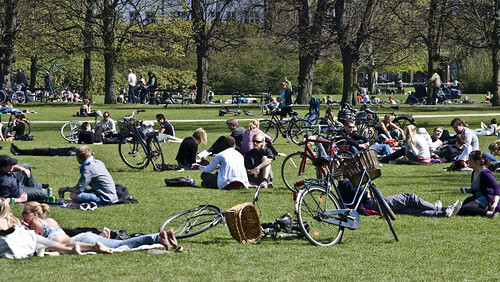 Another crazy and radical idea from the City of Copenhagen. Cycling in parks! Let's try it! Ironically, cycling in parks has long been prohibited. Bicycle are transport and belong on the bicycle lanes. You can walk your bike through the parks and park them by your blanket, sure, but riding them has been a no-no. Parks are for walking/meandering/promenading. Now the City is changing all that, making it permissable to cycle in many parks. Nice. tags: "bike infrastructure", "bike laws"